A return to the 1941 uniform, minus the "SA" across the chest. From 1936 to 1941 the short-sleeved jumper had been the primary uniform with the long-sleeved version worn as an alternate. 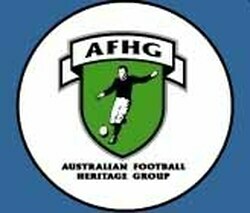 In 1946 this was reversed with the majority of players wearing the long-sleeved jumper. Another National Carnival meant another design change. This was the second phase in the evolution of the South Australian jumper towards the modern and most well-known design. The vees were straightened and the sock design that had remained in use since 1930 was replaced by a much simpler design of red socks with navy blue tops. From 1947 to 1952 the navy blue shoulder trim from the previous era remained in place. However, for the 1953 Carnival the shoulder trim was changed to red, matching the cuffs on the long-sleeved jumper that had been introduced in 1949 (see below right). In 1947-48 no long-sleeved version of the jumper was produced so players wore red, long-sleeved club jumpers underneath as required. In 1949 an official long-sleeved jumper was made available. NOTE - the red cuffs on these jumpers did not match the colour used on the shoulder trim of the sleeveless version until 1953. A red vee was introduced at the neck and the navy blue and gold vees returned to a curved look, similar to the style first used 1936-46. For the 1958 National Carnival a SANFL logo featuring a piping shrike was added to the breast of the jumper. The piping shrike is the symbolic bird that has featured on the South Australian flag, State Emblem and Coat of Arms since 1904. The other design change involved the vees - they were noticeably thinner, giving them a tighter look at the shoulders. Ever since Australian football's earliest years players who preferred a sleeveless jumper had to create one themselves by cutting off the sleeves. Although South Australia and Western Australia had experimented with sleeveless jumpers in the 1920s-40s it was not until the late 1950s/early 1960s that the use of sleeveless jumpers became widespread at club level. For the 1961 National Carnival both South Australia and Victoria switched to sleeveless State jumpers, with Western Australia making the switch in 1962. From this point onward all South Australian interstate jumpers were sleeveless, with the long-sleeved versions only being issued on request. The shorts changed from the baggier style worn since the early-1930s to the shorter and tighter-fitting look of the 1970s-80s. 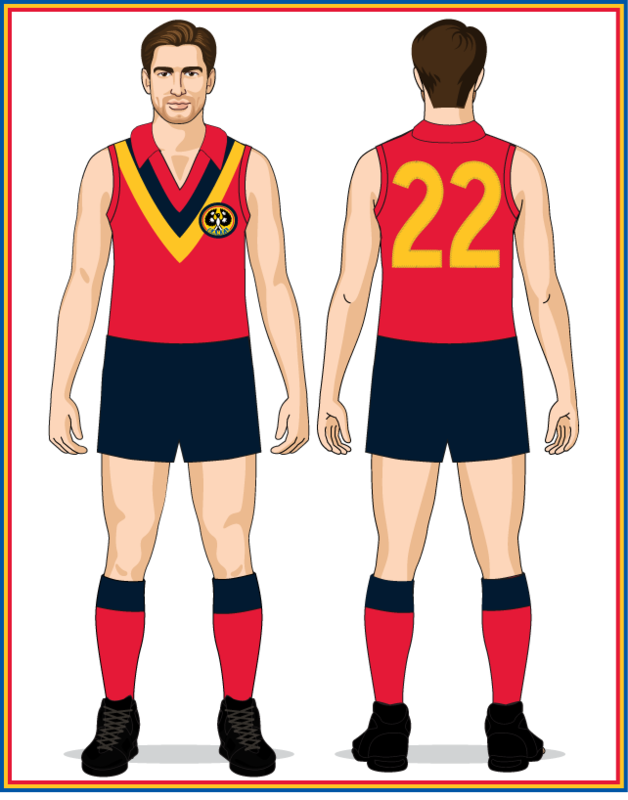 The SANFL patch worn since 1958 was replaced by a one-off patch worn by all SANFL teams throughout the 1977 season to celebrate the league's centenary year. The new SANFL logo (first seen inside the second zero on the 1977 centenary patch) replaced the previous version worn 1958-76.